I love the way yellow and violet combined to create this misty morning. Beautiful! Would you mind if I put some of your works on my desktop screensaver at the office? Most of them are so inspiring to me and just a joy to come across in my inbox. It would be my honor! I am an avid follower and look forward to your daily creations, which are always very inspiring. Sometimes, the words you add, be they your own thoughts, or a poem referenced, are equally meaningful and rewarding. A friend and fellow artist sent me your link early last year. I don’t know how many followers you have, but I have likewise passed on your “paint and simple” email link a number of times. I found your “Black Birds, Quiet Morning” especially interesting as I have had a similar fascination with the look of “birds on a wire”. 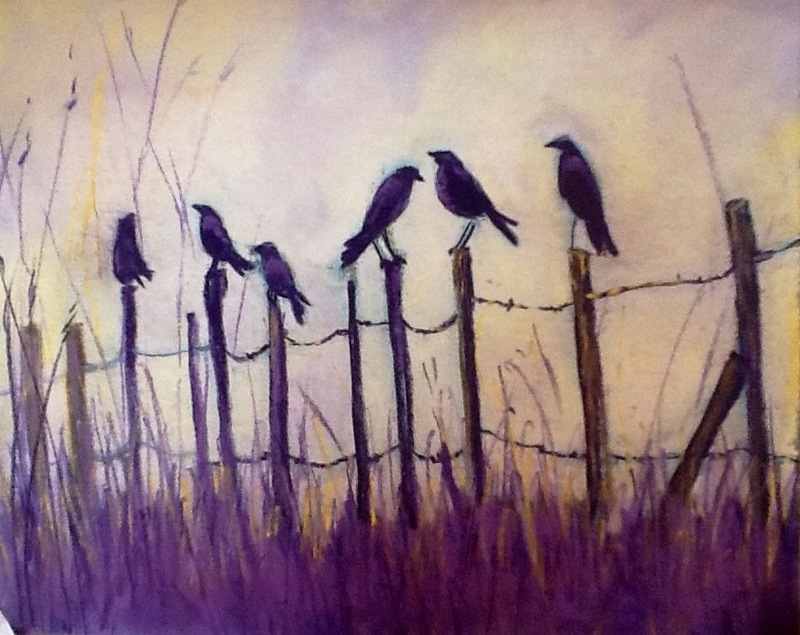 I’m not a plein air painter, but I recently did a number of small canvases, where I tried to portray the same old fence, but with different arrangements of birds as a foreground silhouette against a variety of different skies. If you get a chance, please check out “The Birds” series on my webpage (jack-malloch.artistwebsites.com). I’d greatly appreciate any feedback you might be willing to offer. Again, thank you so much for sharing your creations and thoughts, they certainly bring a positive light to my day. Can’t wait to check out your paintings, thanks for your kind words and passing along my blog. i love this one. different feeling for you, not sure what it is exactly but i wouldn’t have id’d it as one of yours. that said, as i do w so much of your work, i really enjoyed today’s painting.